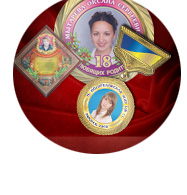 For ceremonial events, anniversaries, weddings, holidays, competitions, for events where one would like to congratulate each person individually, our company offers exclusive gifts and souvenirs which can consist of standard elements with changed images or we can create individual, exclusive design at customer’s wish. This can be a set of products with a specific logo, collage of pictures, individual, unique text, made by printing on fabric, metal, wood with elements of plexiglass and with full-color images placed under an optical lens. Exclusive individual products afford great pleasure and will be a wonderful present for any occasion and event.